Photo from Facebook.Com. He's listed as one of the most influential persons found in Facebook World. WIKIPEDIA introduces Jay Michael Ortuoste Jaboneta, better known as Jay Jaboneta, as a Filipino blogger, philanthropist, new media advocate, and online community organizer, who until recently served as Head for New Media under the Presidential Communications Operations Office of President Benigno Aquino III. Kuya Jay is best known for having sparked the idea that led to the creation the charitable organization Philippine Funds for Little Kids for which Kuya Jay was recognized by Yahoo! Southeast Asia as one of their “7 Modern Day Pinoy Heroes.” In May 2012, The Philippine Funds for Little Kids was incorporated as the Yellow Boat of Hope Foundation, Inc.
KuyaMarlon: What are the things that people don't know about Jay Jaboneta? Kuya Jay: I guess most of the things that people don't know about me are my failures. During college, I failed in two major subjects in the course that I was taking up and I had to shift to another course. But before I did that, I took a sabbatical and left school for a period of almost 2 years. KuyaMarlon: How did you "fire" start the Yellow Boat Project? Kuya Jay: The concept of the Yellow Boat Project started when I first found out about the story of the children who have to swim to school in Layag-Layag in Zamboanga City in October 2010. Within one week, together with friends on Facebook, we were able to raise P70,000 which we believe was enough to buy them a boat. We eventually had to build a boat and when we asked the community what the boat symbolized for them, they answered it meant like a source of new hope for them that's why all the boats are named Bagong Pag-asa. KuyaMarlon: Who is Jay Jaboneta in his youth days? Kuya Jay: I was someone you would consider nerdy and I was actually the class valedictorian in high school. And so I believe nerds rule the world. KuyaMarlon: What is the most valuable lesson you've learned in life? Kuya Jay: There are many lessons that I have learned over the years but let me offer my theory on HOPE to answer this one. When I was preparing for my talk in TEDxMontpellier in France last January 2012, I came up with my personal theory on HOPE which goes like this: H stands for harnessing your potential, it is about finding your passion in life. I don't think you can ever do great work if you do not love what you do. You have to find something worthwhile to do that at the same time also pays the bills. O stands for opening your mind and your heart and this is especially true for failures and mistakes. There is no such thing as a perfect life. Learn to live with the punches but also keep your eyes open to opportunities. P is about perspiration and this is about taking action. Pursue your dreams and make them come true. And lastly E stands for Empowering Others and it is very important that you share your gift with others and share your story. KuyaMarlon: Based on your own experiences, why is it important to organize community works and services? Kuya Jay: It is not only important but it is also crucial to nation-building. No one ever built a family alone - so the same goes for a company, a nonprofit organization, a community and a nation. 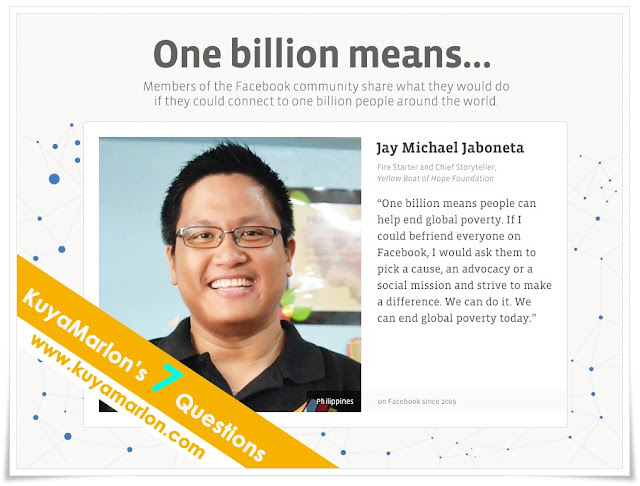 KuyaMarlon: What advice you can give to the Filipino Youth on how they can make a difference to others' life? Kuya Jay: I go back to my HOPE theory. Find something that you love to do that also adds value to other people's lives and do it. Remember, little things make a big difference to God. It doesn't matter if you or others perceive it as big or small, as long as you do it to the best of your abilities, you're making a difference. KuyaMarlon: If you'll be given a chance to face one person from the past (celebrity, hero, president, family member, ordinary person, and etc. ), who is he/she? Why would you like to meet him/her? Kuya Jay: I would love to meet with Jose Rizal and Andres Bonifacio and together we will rewrite the course of Philippine history. Hehehe!